Can't wait! My family is right down the road in Yazoo County. This will be a great chance to get fishy and see the fam all in one trip! Big Apple Inn, downtown Jackson... if you have the nerve. Amanda, please reach out to Matt and ask hi via email. I mentioned to him that we might need a few spots other than just the lightening talks, not sure if he still has any open. I've eaten the pig ear sandwiches. The place is barely big enough to turn around in, but it's been a fixture here for some time. Martin... maybe you could give a lightning talk on the experience. Here is the final T-Shirt art approved by our MS Host Matt Wagner and those involved. The shirts will be printed using a dye sublimation technique like last year's Georgia shirts. The shirt is the same 100% poly quick dry material, in a nice sand color. Everyone attending will get a shirt. Dennis will be printing some extras and shipping a box full to me in advance for those interested in buying a shirt. Registration details will be available soon. That Mona Lisa fish is looking at me! In general, what would someone from New York State be able to collect and keep at this convention ? 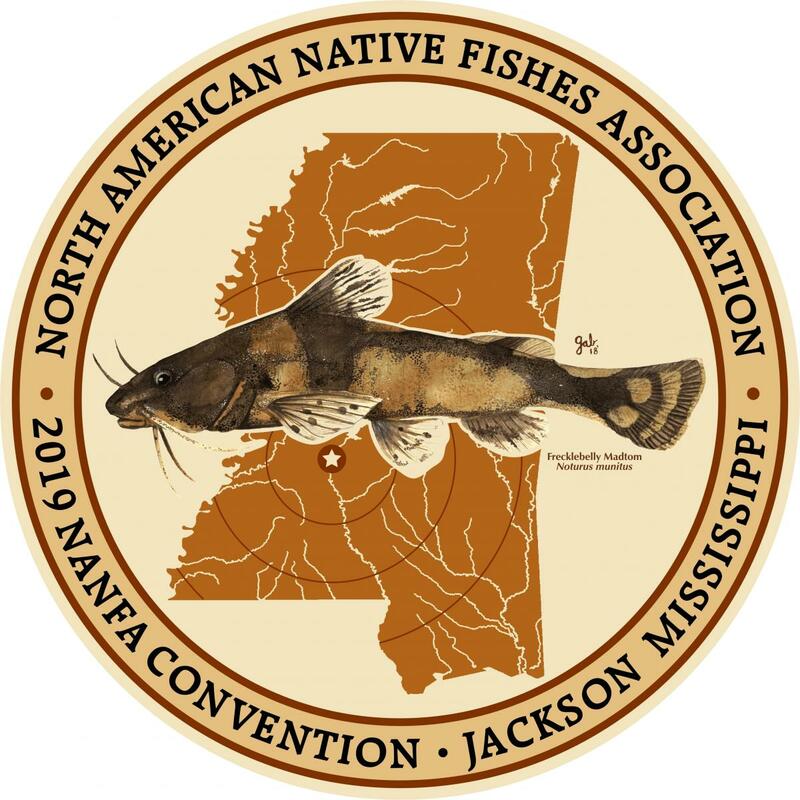 Registration is now open for NANFAcon2019 in Jackson, Mississippi. Go to the convention announcement page and read all about it as well as find the link to registration and online payment to secure your spot (and this year get a free convention t-shirt!). It varies so much. Each convention is somewhat unique. Keep checking the announcement page, it will get updated occasionally, as our host provides more info. Just my opinion, but I dont think you will need waders in MS in June. And I dont know of anyone that has ever tried to bring a seine in an airplane (although people do take skis all over the place so maybe?? It's handy that collecting with any seine in the 6 to 20ft range is often done best with 2 to 4 workers per seine. And more is not unusual at large gatherings. Apprentice/trainee pole-wielder, wild shuffle dancers (n=2 or 3), bucket carriers, kibbitzers, identifiers, photographers, list keepers, dry-footers ... there's a variety of optional roles available, at any given moment. So if you are flying in, don't fret about bringing a seine. The drive-to crowd will bring plenty. That said, I think one of the newer Perfect Dipnets would break down and possibly fit into a suitcase. Teach a man to fish and you gift him a hobby for a lifetime. I have taken collecting gear on a plane several times. I have a Samsonite hard-sided, 2-suiter suitcase that I bag check, it is really too big to fit in overhead bins on the plane, although there are plenty of people who do so, eliminating space for others. I bet TSA would not allow the net handle through security in a carry-on anyway. My standard 12 inch square Perfect Dip Net head fits perfectly. I have a two-piece handle that fits as well. I have a 9 inch square Perfect Dip Net head that fits in carry-on size luggage, and the two-piece handle fits if you separate the two pieces. The handle is too long to fit in the suitcase when slid together. I have not taken this on a plane, only on road trips where my assembled net would have been a hassle to others. I wear Cabela's Gore-tex type, stocking-foot waders which roll up to be about a foot long and 6 inches in diameter. They and a pair of wading boots easily fit in my large suitcase along my with dip net and clothes. I buy an inexpensive bucket at my destination to complete my fish collection outfit. The only problem I've had was on returning from Florida in 2016. I had collected Pteronotropis colei in a sandy-bottomed river where my boots got lots of sand in them. After two days of drying in my hotel room, the boots were still wet and thus still held some sand. Although I put the boots in closed plastic bags, TSA opened those bags and did not close them back up. As a result, sand got into all of my clothes and other items. There was also a sheet from TSA on how to properly pack a suitcase, although wet, sandy wading boots were not addressed in it. I have heard that those who travel to tropical fish shows are allowed to take their fish on the plane. I have never done so, shipping them back to my home instead using the post office of UPS. As others have said, NANFA collecting trips have plenty of seines by those driving so there's no need to take one on a plane. On non-NANFA trips, I'm collect by myself so there is no one to help handle a seine anyway. Thanks everyone,all good stuff. I was thinking i needed my trusty one man seine [ 4 ft.]. My two dipnets are Pentair DN33AL monorail, they don't collapse. All of you have given me food for thought,thanks.